A digester tank at the Gundersen Envision facility. Photo by Trina La Susa. Did you know that Americans waste an average of one pound of food per person per day? Reducing waste and saving money starts by taking only as much food as you need and eating your leftovers. Reusable containers like those offered by UW Dining’s Ticket to Takeout program can help you do just that. Meanwhile, our compost system is a crucial component of waste handling at the UW–Madison. Below we offer information about where and how to compost on campus. If you’d like to learn about home compost, scroll to the bottom of the page! Waste and Recycling staff from Facilities Planning & Management collect food scraps from locations across campus (see map below) and transport them to a biodigester operated by our partner, Gundersen Envision. These food scraps are combined with cow manure from local dairy farms as well as compost material from other sources. 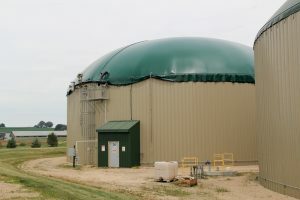 The digestion process produces biogas, which Gundersen harnesses to generate electricity, as well as liquid fertilizer and solid compost, both of which are used as soil amendments to grow food. The UW West Madison Agricultural Research Station processes non-food organic material from campus, including manure and bedding from animal science facilities and plant materials from greenhouses and landscaping. What can I put in a UW–Madison compost collection bin? The UW–Madison collects food waste from residence halls, dining halls, student Unions, Union-operated cafés, the UW Hospital, some athletic facilities, and some academic buildings. If you are interested in collecting food waste in a building where collection is not currently available, the Compost Stewards program may be able to help. Please contact us with questions. Click and zoom through our custom Google Map to find compost locations on the UW–Madison campus. Click the button in the upper left corner of the map (next to “UW–Madison Composting Locations”) to view the key for the different types of compost sites. Note: locations subject to change. What about food waste from home? Set up your own compost system. Decide if a backyard or vermicompost system fits best with your available space and volume of food scraps. The UW–Extension Master Composter Program offers resources and support. Compost your food scraps at a community garden. Find a garden near you. Ask the garden coordinator if you could bring your food scraps to the compost pile and/or help maintain the compost pile. Work with a private food waste collection service. A couple local options include Earth Stew Compost Services and Rooted Curbside Compost.